The old website was generating very few enquiries. There was no way for site visitors to book appointments through the website. The design was poor, giving a bad first impression to site visitors. The blog functionality was limited making content marketing difficult. Rebuild the website in WordPress, to take advantage of the platform’s superior content marketing capabilities. Provide a new mobile friendly web design. 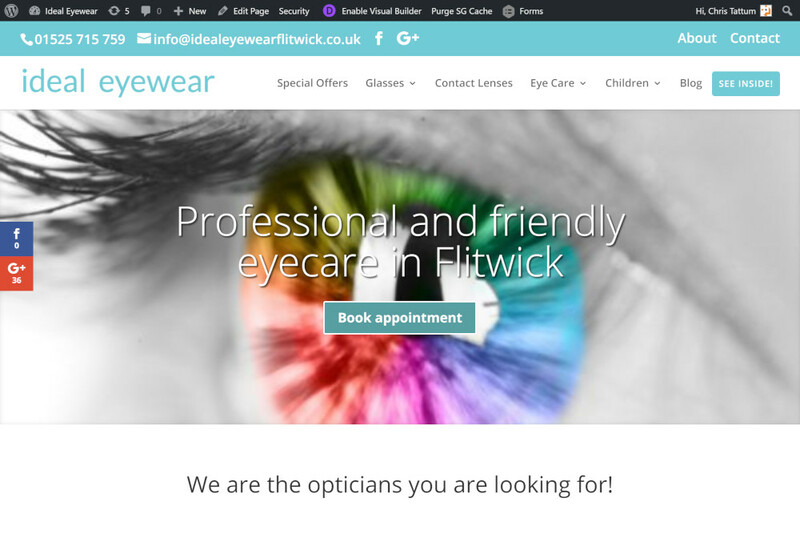 Make the design vibrant and eye catching, using plenty of photography to showcase the range of glasses and services, and to reflect a professional image. Implement a new appointment booking form easily accessible throughout the entire site. Appointment requests are then emailed to the site admin, and stored in the site database for future reference. Add an easy to use contact form, for general enquiries. Integrate a Facebook page feed on the blog page. Add social sharing icons on articles and other featured pages, so that site visitors can share useful content with their own social networks. Allow all content to be edited through the easy to use WordPress admin area. SEO friendly and readable URLs. During the first week, 6 appointments were booked through the site. This was more than on the old site in over 2 years. When we started our business we initially went with Moonfruit to build our first website . As the business grew we could not keep up with the changes required and we had to do them ourselves. I met up with Chris at a meeting and the rest is history. He listened to what I wanted and built our website so it looked clean fresh and professional. If I need anything doing that I feel I cannot do myself, then Chris is the man to ask. He will either do it for you or point you in the right direction. As our requirements changed he again listened and updated, checking back and communicating at regular intervals. Chris has also made suggestions as to what he knows will work to help move our business forward and we will indeed be looking to Pechrian to implement those soon.